When we think of Threads of Life corporate partners we often connect them to the financial support they provide. The reality is that financial support is only one facet of the tremendous support partners offer to Threads of Life and our families. Many of our partners’ employees are key volunteers. 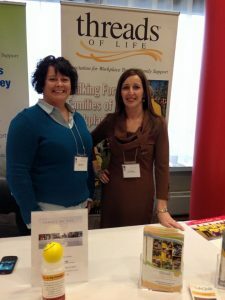 They volunteer with Steps for Life planning committees and represent Threads of Life at trade shows. They also volunteer their professional services. Some examples are legal, accounting, translation, or human resources and policy development. Threads of Life was born, sustained and grows on the strength of its volunteers. In fact, Threads of Life would not exist without our volunteers. Many of today’s top Canadian companies are encouraging their employees to volunteer in their communities. But why? What’s in it for the corporation? Why would an employee want to volunteer? Who benefits from corporate volunteerism? Frankly, everyone benefits from employees and employers giving back to their communities and to families involved in workplace tragedy. It’s about being socially responsible and about doing the right thing and feeling good about doing it. The benefits, however, run much deeper than just feeling good about ourselves. Companies that promote a volunteer program benefit from greater employee engagement. Employees feel better about working for the company and feel better about themselves, creating higher morale and productivity. More engaged and productive employees can only make a positive impact on a corporation’s bottom line. Volunteer efforts in the community can be great team-building opportunities. Away from the stress of their everyday job, employees get to work together to achieve a common goal. Employees also get the chance to hone existing skills and learn new ones. A stronger and more skilled employee base can be achieved with a strong corporate volunteer program. It is important for a company to provide volunteer opportunities with a charitable organization that the employees can connect with. Supporting an obscure foundation that preserves the history of pet rocks because the company’s CEO is an avid collector may not be a wise or successful choice. Choosing a charity that has a broad appeal and clear mission, such as Threads of Life, could be a much better choice. Threads of Life supports families affected by workplace tragedy, and most people know of or have been affected in some way by a workplace injury, fatality or disease. If their hearts are behind the cause, an employee volunteer program is more likely to be a successful program. The millennial generation is hitting the workforce. It is well-documented that when seeking employment, this generation places a priority on its desire to make the world a better place – they are not just focused on salary and benefits. Social and environmental responsibility is high on their list of priorities. An employer’s effort to recruit the best of the best can be bolstered with a solid corporate volunteer program. Employees volunteering out in the community can raise a company’s visibility in the community. Good press and building brand awareness should not be the goal behind a company’s volunteer program, but it can be a nice added benefit. People want to do business with socially-responsible companies that give back to their communities. Most importantly, the community benefits. With Threads of Life as your Charity of Choice, you are creating awareness in the community of workplace safety, and you’re strengthening community members by supporting programs and services for those affected by workplace tragedy. Together, we can make a difference. having experienced a serious injury while working as a millwright. Kevin was forced to change careers, and earned a post-grad certificate in health & safety management as well as a diploma in human resources.